Update: WyzeMoro has posted a CV of his father here. 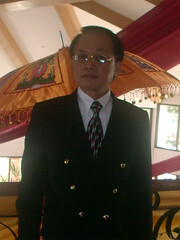 Moslemen T. Macarambon Sr. has been appointed a new Commission on Elections Commissioner. Not much is known about him at this time, except that he is a former RTC Judge in Iligan City and father of fellow blogger Moslemen Macarambon Jr , a.k.a. WyzeMoro. There are reports linking Macarambon to former Comelec Commissioner Virgilio “Hello Garci” Garcillano. We asked Wyzemoro if his father is the same person as a certain Renault or Lou Macarambon, who was mentioned in the “Hello Garci” tapes. NO! Renault or Lou is different. My dad is not in the hello garci tape. I hope this clarify. Thanks for asking. In an interview with Macarambonon ANC, he said he knows Garci, but Arroyo’s phonepal probably does not know him. More on Macarambon’s appointment at the PCIJ blog.